Hundreds of people attended the 2nd Annual Overdose Awareness Vigil held in New Canaan Aug. 30, 2018. 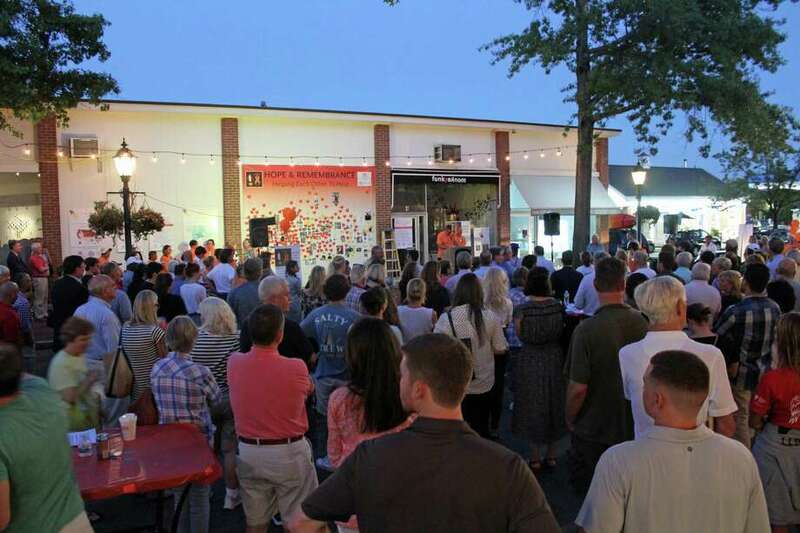 NEW CANAAN — It was a night of remembrance and conversation on South Avenue as people from in and out of town came to attend the 2nd Annual Awareness Vigil. In its second year, the event sought to do away with the stigma associated with substance abuse and to allow people to share their stories in the open in order to raise awareness about issues that are commonly kept from view. For Paul Reinhardt, the founder of New Canaan Parent Support Group and an organizer of the event, this second annual event brought something more than the first. “Sharing stories is the best way we learn and we’re really excited to have these speakers come here tonight,” Reinhardt said. Reihardt was alluding to one of the most heartfelt moments of the night was around 7:35 p.m. when four different speakers, ranging from parents to recent high school graduates, shared their personal stories of recovery and loss. Each of the four speakers brought their own story but the singular message to those who listened was clear: you are not alone and there is help. Orange, the theme color of the event, was spread throughout the space. Members of Team Orange, the volunteer group who helped organize and prepare the event, were talking with attendees, providing information and guidance. Michelle Robinson, who works at Silver Hill Hospital and volunteers with Team Orange, had helped prepare the event before its 7:00 p.m. start time. Community officials like First Selectman Kevin Moynihan, Superintendent of Schools Bryan Luizzi and state senators and representatives were in attendance. People from Fairfield County also came to partake in the evening event.